The Unity Raceway racing program schedule for this Sunday, September 10, has been canceled out of concerns for track owner George Fernald’s health. Fernald was hospitalized for nine days in late August with internal shingles, complicated by both meningitis and encephalitis. He returned home on Aug. 24, where he has been receiving treatments since. This Sunday marks the 2nd year of the raceway being leased and operated by Nick Huff. Taking over the track in mid August of 2014, after no signs of opening for the year by any other parties, Huff was able to quickly put together a 4 race schedule that began August 17th. All events were successful, and most importantly, Huff accomplished his goal of continuing the 2 day Long John tradition that hasn’t missed a year since it’s beginning thanks to him. Time has surely flown by, and it’s been a great ride that is soon to come to an end with the recent purchase of the raceway. Management will change hands in 2017, but racing will surely continue. We hope this will not come with many changes though, as we have proven that Nick’s ideas and philosophy on what’s best for the raceway are certainly a step in the right direction. We want to thank you for your continued support of Unity Raceway, for all of the 68 years of it’s presence, and especially these last couple. Lets pack the stands this Sunday August 21st, for 7 divisions of our continually growing car counts and exciting racing all for just $5 beginning at 2:30pm, and show that Unity Raceway can’t be stopped thru thick and thin. 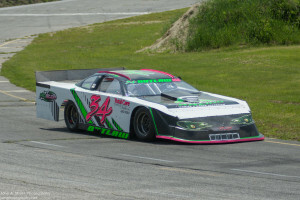 This track will always stand as the Toughest Oval in Maine, Strong and LOUD!! This weekend, Unity Raceway prepares for another exciting Sunday of competition. Having four different winners in four Late Model Races, with last week being a first career win in the division. Kris Matchett was victorious, picking up his first win in his second full season of Late Models. Since making the jump, he’s raced the car at Wiscassett and Speedway 95 as well as Unity, and was glad that the win came at his home track that started it all. It… was also more honorable that it came on the most competitive weekly LMS race Unity has seen in the last couple years. Other victors this season are John Kalel, last years champion, Ben Erskine, and Nick Hinkley. Biting at their heals is Ryan Robinson though, with three, third place finishes thus far, can he make it five for five this Sunday.